An interview with the democratic socialist who just knocked off one of the Virginia GOP's legislative leaders. On Tuesday, democratic socialist Lee Carter unseated Jackson Miller, the Republican majority whip of Virginia’s House of Delegates. Buoyed by the enthusiasm around the Bernie Sanders campaign and backed by the Washington DC chapter of Democratic Socialists of America, Carter successfully campaigned on single-payer health care, getting money out of politics, and putting the interests of working-class Virginians above those of big donors. Running in Virginia’s 50th district, which includes the city of Manassas, Carter won with a nine-point spread, 54 to 46 percent. His Republican opponents distributed red-baiting mailers comparing him to Stalin, and the state’s Democratic Party abandoned him when he refused to tone down his message, especially his opposition to Dominion Energy’s plans for a natural gas pipeline. Jacobin’s Meagan Day reached out to Carter to talk democratic socialism, single-payer health care, and how working-class politics can win outside the big cities. Most local campaigns are about local issues. But you made yours about big issues, like single-payer and also getting money out of politics, that cut across state lines and speak to all Americans. Why did you do that? It’s not just local conditions that you focus on, it’s material conditions. The reason I picked big transformational themes for my campaign is that these are the things I’m passionate about, and that will have the greatest long-term impact on people’s lives. When it comes to getting money out of politics, for instance, so many politicians campaign on issues they never speak about again after election day because the donors don’t like it. That’s why I rejected corporate donors — I needed to show people that I’m actually going to fight for the voters because they’re the only people I’m accountable to. Why did you run on the Democratic Party ballot line, rather than as an independent? And how did the Democratic Party interact with your campaign? Running as an independent in Virginia would have been completely prohibitive. In a swing state, you can only really run without an established ballot line in smaller races, like city and town council, district attorney, and even mayoral races. But when you have an electorate of eighty-five thousand people and you’re trying to get their attention in an off-year, when they’re not normally inclined to pay attention to politics in the first place, that’s one hurdle that you just don’t need. As for the Democrats, it made the most sense to me to build a coalition of groups focused on the things that the Democratic Party’s voter base and the Democratic Socialists of America have in common, such as fighting for an inclusive society, fighting for economic empowerment of working people, fighting to eliminate poverty, and transitioning away from fossil fuels. The groups whose support I relied on included grassroots member-led Democratic organizations as well as labor unions and DSA. I did, however, end up in conflict with the state party itself, particularly its more right-wing elements, and ultimately ran without the support of the state’s party leadership. But I was only able to do so and win because I had the support of a large section of the Democratic Party’s actual base. What did the Sanders campaign last year mean for your campaign, your platform, and your politics this year? I announced my campaign in February of 2016, when we still were still worried that the general election might be between Clinton and Bush. We saw Bernie Sanders come out, a previously unknown independent socialist senator from Vermont, and he was supposed to be a 1 percent also-ran candidate by all rights. He went out there and got 13 million votes in the Democratic primary, and frankly if that primary schedule had been thirty days longer he probably would’ve won, because he had all the momentum on his side. It went to show that if you deliver a message of economic empowerment for working people, and you walk the walk and don’t take any contributions from the corporate interests that really have control over government at all levels, and you combine those two things with a social vision of an inclusive society, people from all walks of life will react to that. You will get millions and millions of people who’ve become disaffected with the political process, who’ve become jaded and have started to think No party represents me or Why should I vote when they’re all the same? — you can get those folks to have hope again and show up at the polls and demand to be heard. When did you join Democratic Socialists of America, and what did it mean for your campaign? I’ve always been a bit disgruntled as a Democrat, but it was the Sanders campaign that got me past my fear of the s-word, as it did for millions of others. So I got to reading some works of economic theory (Jacobin, books from Verso press, the economist Richard Wolff) and realized, hey, this big scary boogeyman is just democracy in the workplace. Over the winter of 2016 and 2017, it clicked. So I joined DSA and started paying dues in April, and being with a bunch of like-minded folks who are engaged, who are organized and organizing, and who got out there and delivered a message to tens of thousands of residents in my district made all the difference. My campaign knocked over twenty thousand doors in the last four days before the election, and almost half of that was from DSA volunteers. Can you talk a bit about why you think so many people are moving to the left? The story really starts in 2008. We had the global financial crisis, where we saw neoliberal global capitalism collapse in on itself. A lot of people underestimate the damage that was done, but we were days and weeks away from the milk not getting delivered. It was that kind of an economic failure. And we never really addressed the structural problems with our economy that made that kind of collapse possible. And so the recovery that we got was slow and it was not nearly complete. Tens of millions of American workers who had a single full-time job that paid the bills before the financial crisis are now working precariously in two and three part-time jobs trying to make ends meet. We bailed out the big banks with trillions of dollars of taxpayer money, on the promise that the banks wouldn’t foreclose on people’s homes, and then they started foreclosing on homes at a record rate. And so ever since then you’ve seen the center of American and global politics being hollowed out. The center is not holding anymore. So there are large populist movements on both the left and the right, because people are looking for answers, and the mainstream of American politics is no longer providing them. You saw that in 2011 with the Occupy movement, as short-lived as it was, and throughout the world with the Arab Spring uprisings. And then in 2016 you saw the rise of Bernie Sanders on the left and Donald Trump on the right, and this rejection of the center of both parties. That’s because there’s a recognition on the part of tens of millions of people, at least on the subconscious level, that the center of American politics in both parties are the ones responsible for 2008. From a political strategy standpoint, why do you advocate so vehemently for single-payer health care? There are about 750,000 Virginians who have no health insurance whatsoever, almost 10 percent of our population. The more mainstream health care policy proposals are for Medicaid expansion, but that covers 400,000 people. So then what do you do with the 350,000 who still don’t have insurance after that’s done? And what do you do about the million or two million Virginians who have health insurance and can’t afford their deductible? Do you walk away from them, or do you keep fighting? Couple this with the fact that there’s so much uncertainty around health care policy in Washington. There are three groups in Congress: one wants to provide Medicare for All, another wants to make tweaks to the Affordable Care Act, and a third group wants to gut the whole thing and screw over 30 million people. With that much uncertainty, it becomes the responsibility of the state legislatures to step forward and put a single-payer system in place on the state level, so that regardless of what happens in the halls of Congress, the residents of each state will be fine. And then there’s just this sheer fact: if you look at the exit polls from Tuesday night, 39 percent of Virginia voters said that health care was their number one factor in making their decision. You served in the Marines, and health care in the military functions very differently than it does for everyone else. Did your personal experiences with health care affect your decision to prioritize single-payer in your campaign? It’s kind of a tale of two injuries. In the summer of 2009, while I was on active duty, I had a crate full of radios dropped on my leg. I went to medical, they stitched me up, I showed them my ID card, and that was the extent of the process. Then in the civilian workforce, in the summer of 2015, I got shocked and blew my back out pulling away from the lighting control panel I was working in. The experience was completely different. I ended up fighting to get a doctor that would actually try to find out what the problem was, rather than just giving me pills and a bill. If you wonder why we have an opioid crisis in this country, that’s part of it. So it took me three months to find a doctor who wanted to do the hard work to diagnose me, and they ended up treating the problem with a ten-day course of cortisol. It was a very simple fix that got me back up on my feet after not being able to walk more than fifty feet at a time. Of course I had to pay out of pocket for it. When I was able to work again, I called my former employer. They told me point blank, we have work but we don’t have any for you. The company was not comfortable with me on their job sites. Of course I had been trying to get workers’ compensation for nine months, eventually acting as my own attorney. And it shouldn’t be any surprise to Jacobin readers that companies don’t like workers who stand up for their rights. They cut me down to zero hours in retaliation against me for filing a claim. What’s the future of democratic socialism in the electoral arena? It looks bright. DSA almost doubled the number of its members and endorsed candidates who became elected officials on Tuesday. So it goes to show that having unabashed support for working-class issues, issues facing communities of color, issues facing women and climate issues — having a solid stance that is unapologetic, and saying you will fight tooth and nail on all of these — it works. I like to think that this provides a roadmap for other candidates. One of the things this campaign showed is that it’s perhaps harder to get this kind of message across in a place that the establishment Democrats are in control of, like New York and San Francisco with their safe blue seats. But once you get into working-class communities in swing states, it becomes much easier to defeat your opponent. We might even say it’s easier to defeat a Republican than it is to defeat a Democrat. I hope he’ll run, because he’d win. 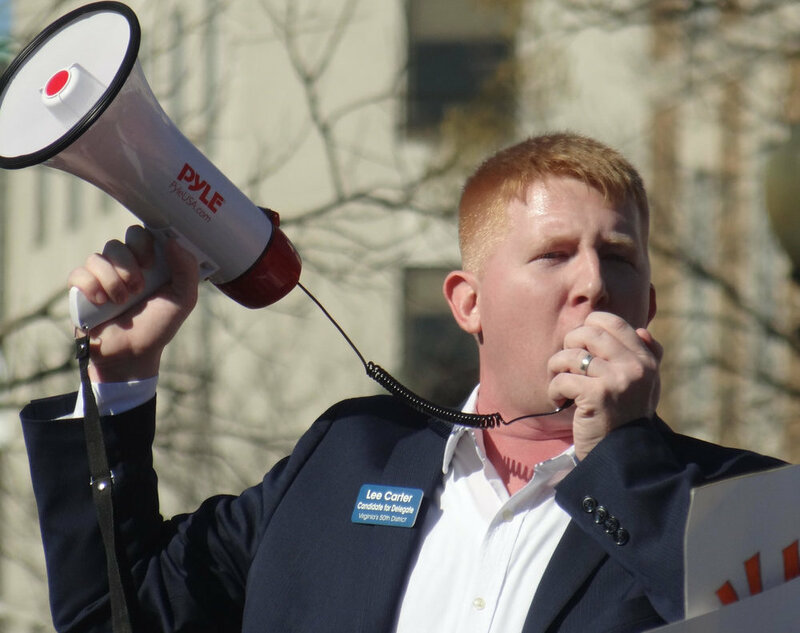 Lee Carter is an elected member of the Virginia House of Delegates for the fiftieth district. He is a member of the Democratic Socialists of America.